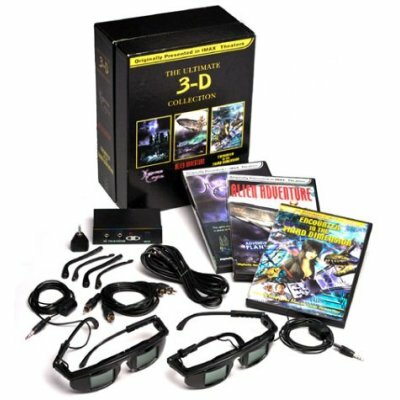 stereo3d.com webboard: 60hz 32" CRT TV..good or no good? Ordinarily, using a shutterglass based system on a 60hz screen will not be enjoyable as you will get considerable flicker. 75hz is "half-bearable" in a completely darkened room but look out for anything white, either on the screen or especially light coming through the window blinds, etc., will "flick you off." 100hz is just fine for most general purpose stereo viewing. eDimensional has a product that "synch-doubles" the signal which effectively doubles the refresh rate allowing you to use their shutterglass setup at low refresh rates, even 60hz. I'm not familiar with this Imax setup you bought, but if it is marketed for use with standard TV's it is likely to have some low refresh compensatory feature built in. If not, I'd try to see if you could hook it up to a computer monitor. Thanks for the reply, man...I got it on Amazon.com...It's not really from "IMAX".. It's the one that comes with the 3 IMAX Movies ( actually, Slingshot released it)...I think it's pretty old.....Just one more thing...Even tho there will be a alot of flickering, will I still see in 3-D? Thanks, again..
All standard American CRT televisions have a fixed 60 Hz refresh rate that can't be altered. (Synch-doubling works only on computers with CRT monitors.) You will get a VERY obvious constant flickering at 60 Hz that you'll just have to live with if you watch the DVDs on television. (You will see the flickering only when looking through the shutter glasses, because with the glasses each eye is actually getting a 30 Hz image.) As Ray says, darkening the room helps somewhat (but not a lot, in my opinion). Some people have a higher tolerance for the 60 Hz flickering than others. (As they concentrate on the movie, their minds can ignore the flickering light.) Others find it a constant, unacceptable annoyance, especially after they've seen flicker-free 3-D images on a computer. You'll have to make this judgment for yourself. If you find the 60 Hz flickering intolerable, but have a 3-D capable computer (CRT monitor, adequate graphics card) then you might want to spend a little more $$ (for a VGA dongle and software stereoscopic player) and watch the DVDs with zero flicker on your computer. Why don't you just give us a shout after you've received the product and messed around with it a bit. Rather than trying to pre-troubleshoot it. My guess is that you'll be getting it anyday now. It could just work fine out of the box for you, who knows. I have no idea about the LED light. The big question is does it work? If it does, I'd try to enjoy it a while before I went to see "Meet the Robinson's" in Disney 3-D (helped out by our friends at realD). I saw it last night and man it was mind-blowing. It's going to take me awhile to get used to my bushleague setup at home after that. The good news, though, is that it shows you the possibilities. Good times ahead. Yeah, I'm looking forward to seeing "Meet The Robinson's"....So the 3-D was awesome? 3d-geek is right, Adam. All three of your IMAX movies have multiple out-of screen, in-your face scenes. Your problem here isn't the shutter glasses or refresh rate (which affects only the amount of flicker). Standard NTSC televisons weren't designed for close-up, wide FOV viewing. You need to be sitting further away from the television -- about 10 feet -- to get maximum 3-D effects and decent image quality (in 2-D or 3-D). That's good to know...Thanks, Charles..